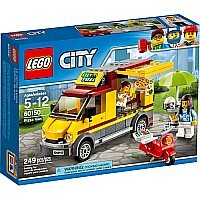 Open up the Pizza Van and get ready to take some orders! Grab the dough and start making a pizza. Cut out a slice and serve it up to the hungry customer before boxing up a couple of fresh pizzas and delivering them on the scooter. Pizza's here, lunch is served! 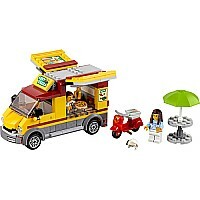 - Includes two minifigures: a pizza van chef and a customer. - Features a Pizza Van, scooter and a buildable table with parasol. 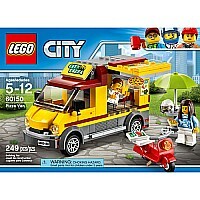 - Pizza Van features opening sides and a kitchen area for the chef to serve pizza. - Scooter features space behind the seat for a pizza box. - Set up the table with parasol. - Raise either side of the Pizza Van to open for business. - Serve the customer a full pizza, a slice or some french fries. 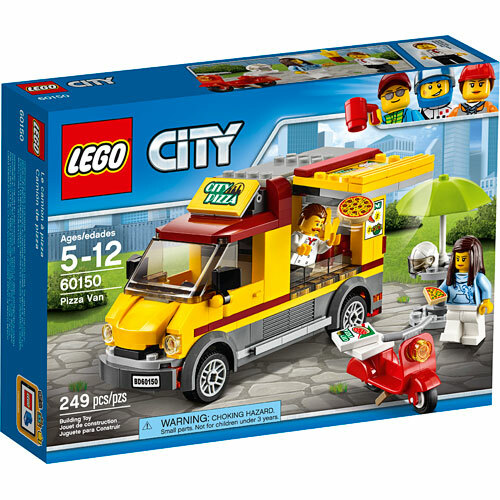 - Accessory elements include a pizza box, full pizza, pizza slice and french fries. - Pizza Van measures over 3" (8cm) high, 5" (14cm) long and 1" (5cm) wide. - Scooter measures over 1" (3cm) high, 1" (5cm) long and under 1" (2cm) wide. - Table with parasol measures over 2" (6cm) high, 1" (4cm) wide and 1" (4cm) deep.